Over the years I’ve been asked quite frequently about the difference between polenta and grits. But they are the same thing – essentially, cornmeal. Polenta is the Italian name for the dish, and grits are well known in the states as a Southern staple. They are both a savory porridge of sorts, made with ground corn. The only thing that is different is the grind of the cornmeal. There are finer grinds and coarser ones. The reason I love polenta (and grits) is that I can do wonderful things with it depending on my mood and the season. For example, with fall approaching, I’ve begun stocking up on one of my favorite canned ingredient – pumpkin puree. I add pumpkin to soups, stews, pastas, meat loaves, risottos, and today, polenta. Pumpkin not only complements the cornmeal flavor, but it creates a beautiful orange color as well. It just screams autumn! When you go to cook your cornmeal as polenta, you need to read the package directions. Because polenta comes in various grinds, the cooking times vary. Just as with purchased pasta, read the directions. 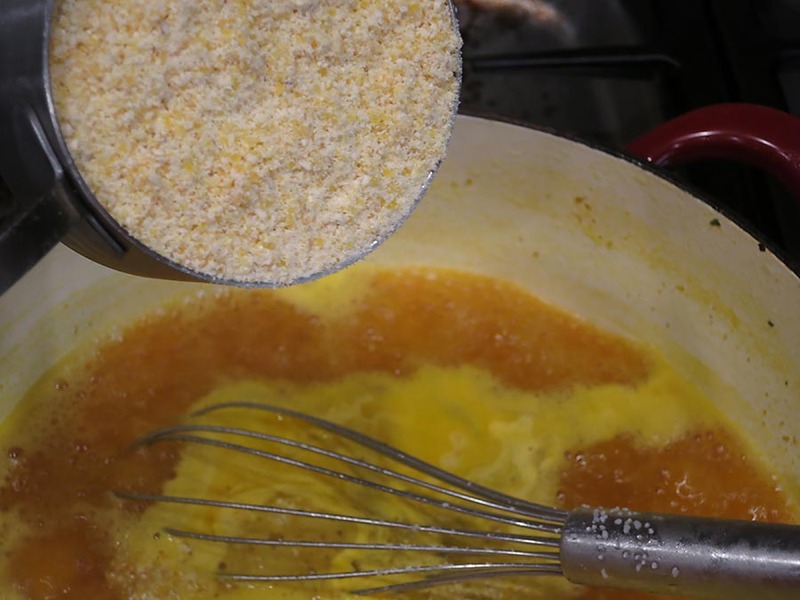 Also keep in mind that cornmeal nearly triples in volume when it cooks, so unless you’re cooking for an army, don’t be tempted to use more than 1 cup of polenta, which is perfect for 4-5 servings. Here’s what I did. This post is also at The Not So Creative Cook today. Jhuls is the author of this blog, and she actually is very creative! She was kind enough to ask me for a guest post, and I chose this dish because of fall approaching, although not fast enough for me. She used the Pumpkin Polenta for Fiesta Friday, which is a weekly post created by Angie over at The Novice Gardener. In a large pot, heat the butter and oil over medium-heat until the butter just browns. Add the onion and stir, lower the heat to medium low. 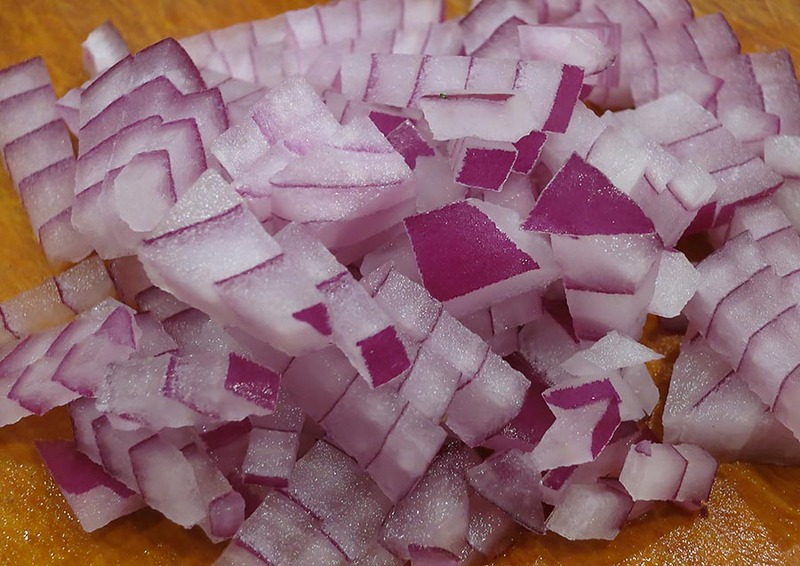 Sauté the onion for about 3-4 minutes. Add the garlic and cook for just about 30 seconds, then stir in the broth, pumpkin, and salt. Turn up the heat and bring the mixture to a boil. Using a whisk, slowly pour in the cornmeal. 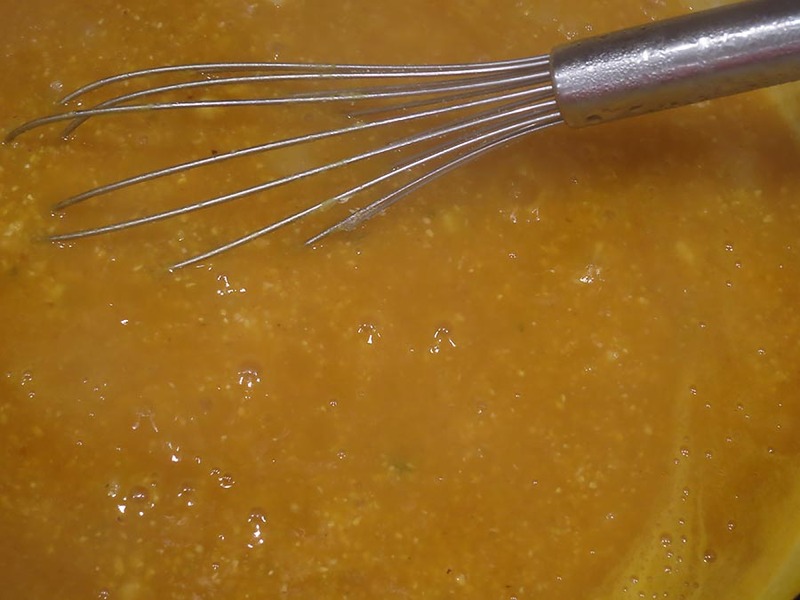 Lower the heat and simmer the polenta, whisking occasionally, until all of the liquid is incorporated. If it gets too thick, add a little more liquid. 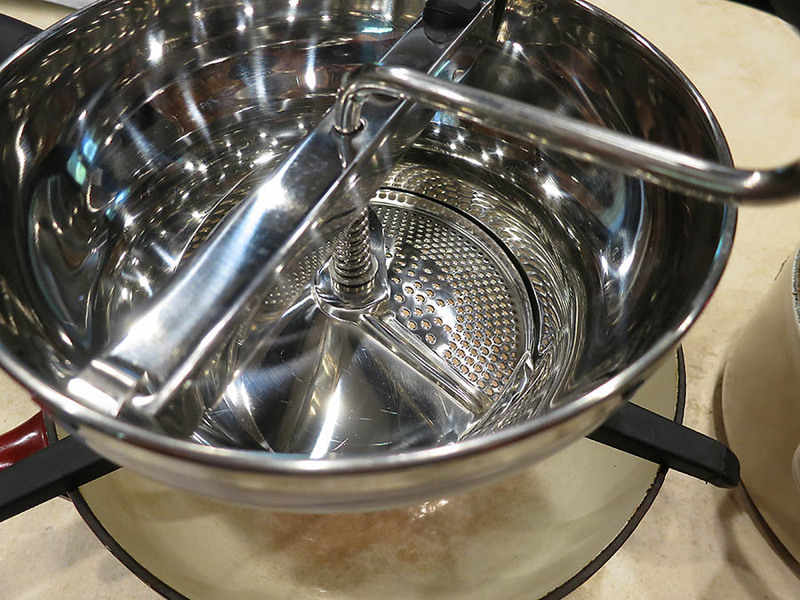 This process should only take about 8-10 minutes unless you’re using a coarser cornmeal. Serve with grated cheese, if desired, such as Parmesan, or, in my case, Monterey Jack! 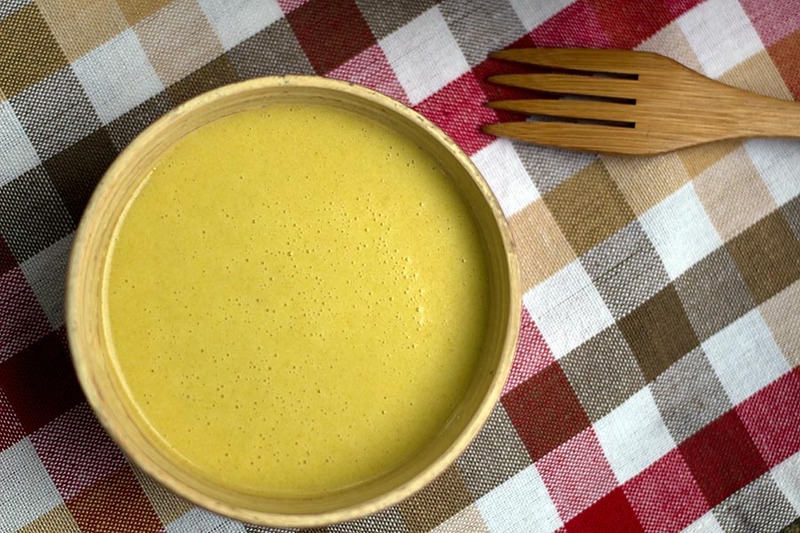 If you want your polenta a little more decadent, substitute some heavy cream or even goat’s milk for some of the broth. Just think of the ways you can make polenta! Add pesto, sun-dried tomatoes, mushrooms, both fresh and dried, ancho chile paste, achiote oil – you name it! note: Just like oatmeal, polenta will keep thickening with time. If you need to refrigerate any leftover polenta, make it really soupy before you store it. Only then will you have a chance of not discovering a cornmeal frisbee in your frig the next day! When I write recipes, I am sometimes specific. After all, for some ingredients, especially when it comes to baking, specific is the only way to go. If I list “8 ounces of cream” or “2 tablespoons of butter,” these ingredients definitely need to be measured for proper baked goods. I’m much less specific with a “medium carrot” or a “small onion” in a recipe. Your carrot might be a little bigger than mine, or my onion smaller, but these differences are minor, and don’t in any way affect the outcome of a recipe. If these measurements were critical, I would go by weight, such as “8 ounces of grated carrot” or “12 ounces of chopped onion”. That would be specific. But silly, really. Sometimes, I am purposely vague. I might list, for example, “5-10″ cloves of garlic, minced.” This is not meant to be confusing. It means that the recipe will definitely work whether you choose 5 or 10 cloves. Furthermore, who knows what size your garlic cloves are? I try to use medium-sized cloves when I’m formulating a recipe, because they come in different sizes! So it’s an estimation. But vagueness is not my goal when writing recipes. Cooking should be about using what you like and enjoy tasting. If you don’t love garlic that much, then go with fewer cloves or omit it entirely, although that would be sad. If you love garlic, go for the gusto! You decide how much garlic flavor you want. And that goes for the above-mentioned carrot and onion. Want more carrot in your stew? Add it. Don’t worry what a recipe lists. A stew will still be a stew whether it contains 1 or 5 carrots. The same thing goes when I list seasonings, like herbs and spices. Everything I list will work together. But, that is to my taste, and taste is subjective. If you haven’t experienced a specific seasoning, I urge you to try it, but perhaps minimally first, to see what you think. For example, I might list 1 – 3 teaspoons ground cumin. Never used it before? Smells funny to you? Maybe don’t ignore it completely, just try one teaspoon for starters. Then see what you think. Some of the ingredients I list are totally optional. For example, I happen to love spicy food. You will see a lot of ground cayenne and cayenne flakes in my recipes. These will always be optional. I completely understand if you don’t care for spicy, or the person for whom you cook has a sensitive tummy. So be it. Just ignore the cayenne. My recipes are just that – my recipes. You need to make them your own. You should definitely own a kitchen scale. They are inexpensive and oh – so useful. Mostly because some ingredients are listed by weight – “6 ounces of chocolate” or “5 ounces of prosciutto.” But sometimes, for example, a recipe in a cookbook says: 1 cup chopped walnuts, or 6 ounces. Forget the measuring cup. I would definitely weigh out 6 ounces of walnuts on the scale, and then chop them. That is just a more specific measurement. I mean, 1 cup of chopped walnuts is a bit vague. I might chop them more than the recipe author intended. See what I mean? For #1, you must chop olives until a measuring cup is full. For #2, you must fill the measuring cup with olives, then chop only those olives. The resulting volumes of chopped olives will be very different for #1 and #2. Personally I think #2 is ridiculous, especially when the type and size of olive is not listed, and pitted or not, but I have seen this in professional cookbooks. So read recipes carefully; some differences in measurements are very subtle. Hopefully all the ingredients and measurements in my recipes are very clear, but I’m also encouraging you to be creative and not follow the recipe to the letter. That is why some of my recipes are more like guides than detailed recipes. This is home cooking, not rocket science, as I’ve said before. Chances are, it will work. One thing I can’t really do is provide the number of servings for a dish. For example, when I made the stuffed spaghetti squash a while back, my husband ate one whole half. (He exercises a lot!) But it would have been four servings for more normal people. So just use your judgment. If you have a question, don’t hesitate to contact me. Chances are someone else is stumped as well. There is always human error with typing, copying and pasting, and so forth, and I am human. But more than anything I want you to have fun with these recipes. Get creative and get cooking! I wrote recently about using apples picked from my apple tree, in order to share the apples with the sneaky raccoons so they don’t steal them all. Now, it’s not that I don’t like being resourceful, it’s just that unfortunately these apples aren’t the greatest tasting apples. They’re somewhat dry and bland, and for that reason alone, I’ve donated them to the raccoons in previous years. Now crabapples were something I was not familiar with at all until we moved to this property about 11 years ago. We have one crabapple tree, which is right next to the apple tree. I know people make a lot of crabapple jelly, and when I was pondering what to do with a bunch of apples and crabapples that I’d picked off of the two trees, I really wanted to do something different from jelly. So all I came up with was the apple-based chutney, and the apple-peach butter. Not that creative, but they were both great. What I needed to do was actually taste the crabapples, because I never have before. Or perhaps if I did, I put it out of my memory. Yuck. What sour little things. And not only that, but they have seeds. The day I was forcing myself to figure something to do with these crabapples was also a day I was wishing for fall to come faster. I had a poussin to roast, along with some sweet potatoes. Bingo. Into a large bowl, I placed cut up sweet potatoes, a few of those green apples, chopped, and some whole crabapples. I tossed them all in some olive oil with some salt, pepper, and dried thyme. Then I simply placed everything around the seasoned poussin and roasted away. I had also steamed some Brussels sprouts (did I mention how much I love fall?) and put those on a plate with chicken and the roasted vegetable and fruit mix. The verdict? Roasted crabapples are delicious. 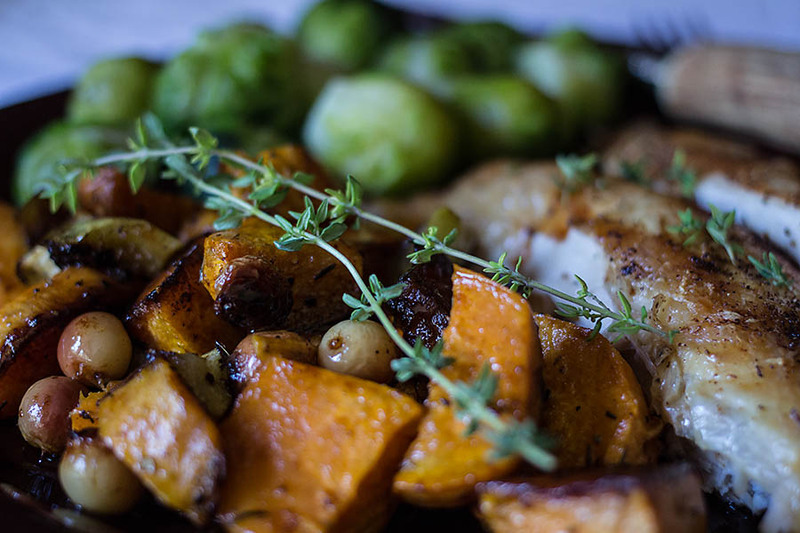 And, of course, they pair really well with sweet potatoes. Plus, you can’t really feel the seeds when the crabapples are roasted, which to me, is a plus. It was 103 degrees outside but I didn’t care. This meal was fabulous. I’m going out to pick more crabapples!!! I grew up with what’s typically referred to here in the states as “German” potato salad. Instead of mayonnaise as the binder with the cooked potatoes, I was only familiar with an oil and vinegar dressing instead. I’m a huge fan of mayonnaise, and “traditional” potato salads, but I still prefer my potato salads with a vinaigrette. Over the years I’ve made all kinds of potato salads, as you can imagine. If you cook like I do, you have as well, being creative with ingredients. I’ve added tomatoes, olives, roasted red bell peppers, capers, chile peppers – you name it. But I saw a recipe in this cookbook that really caught my attention for its simplicity. The cookbook is called The Farm. The recipes are just what you’d expect with a name like the farm. 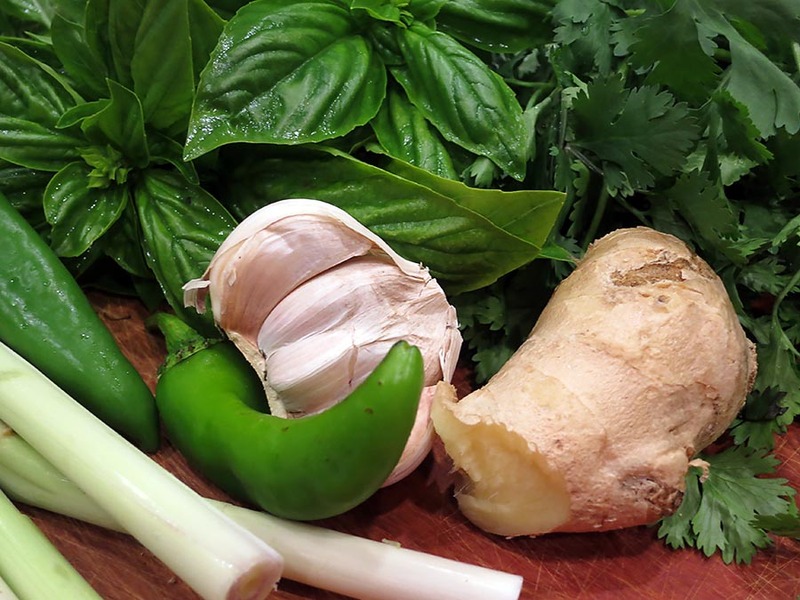 Fresh ingredients and simple cooking. I’ve often mentioned how sometimes simple is best when it comes to cooking, and that’s exactly why I decided to make Ian Knauer’s recipe. Although being the type of cook that I am, I did change it up a bit. But only slightly. His recipe called for both basil and cilantro. I used only cilantro, and added cumin to the vinaigrette. But the potato and corn salad was delicious, and perfect to celebrate the summer coming to an end. 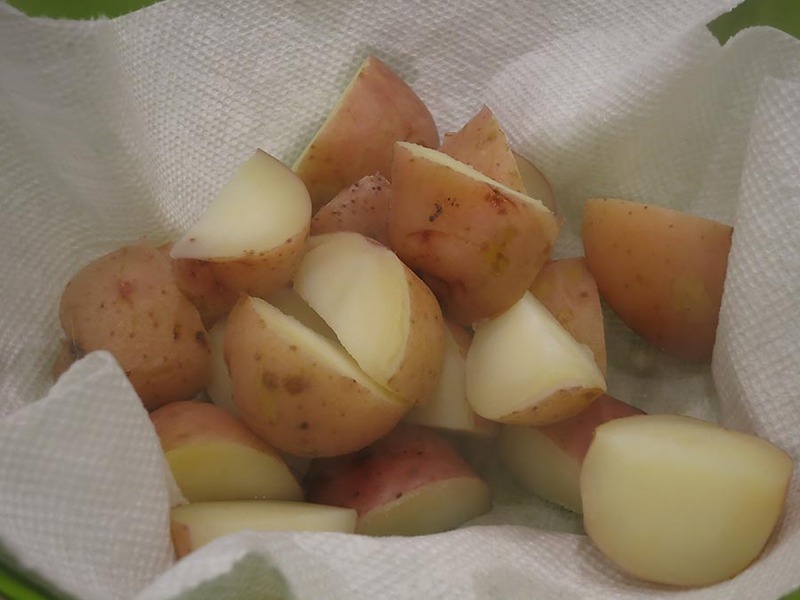 Drain the cooked potatoes so they’re not water-logged, and then place them in a large bowl. 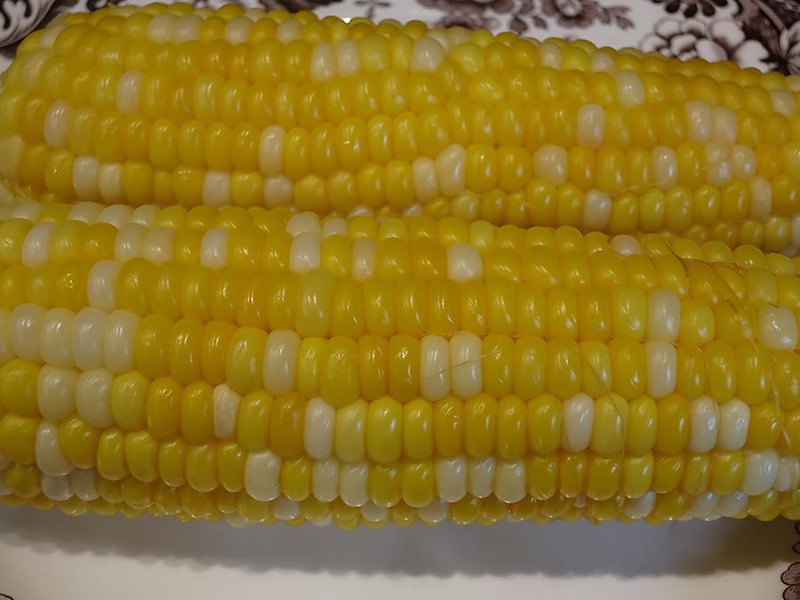 Add the corn and onion. Add a little olive oil and toss the ingredients gently. The olive oil will keep the potatoes moist. Then add the cilantro. Let the salad cool slightly if the potatoes are still hot. Meanwhile, make the vinaigrette. Place all of the ingredients in a blender jar. I included the mayonnaise to make the dressing a little milder and creamier, but that is optional. Place in a bowl for serving. 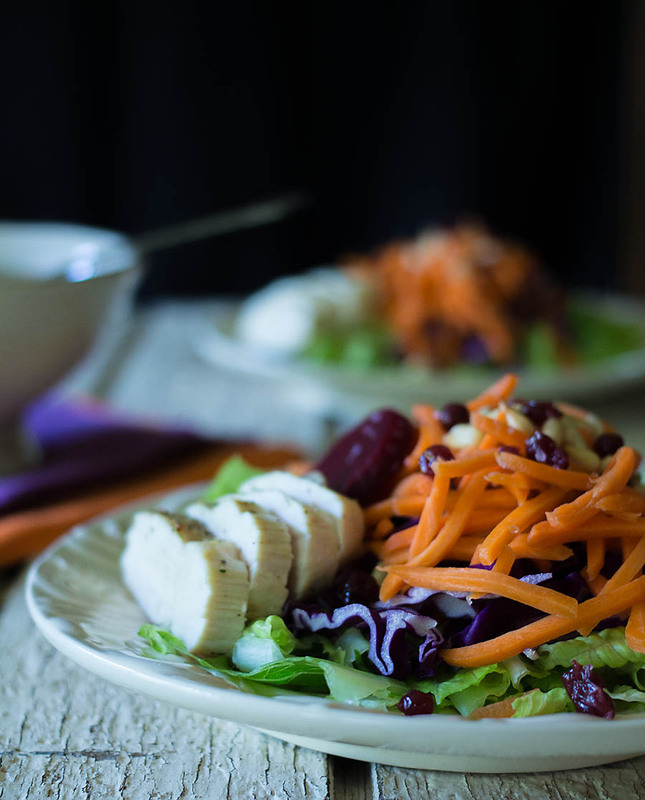 Once the salad is just warm or at room temperature, it can be served. 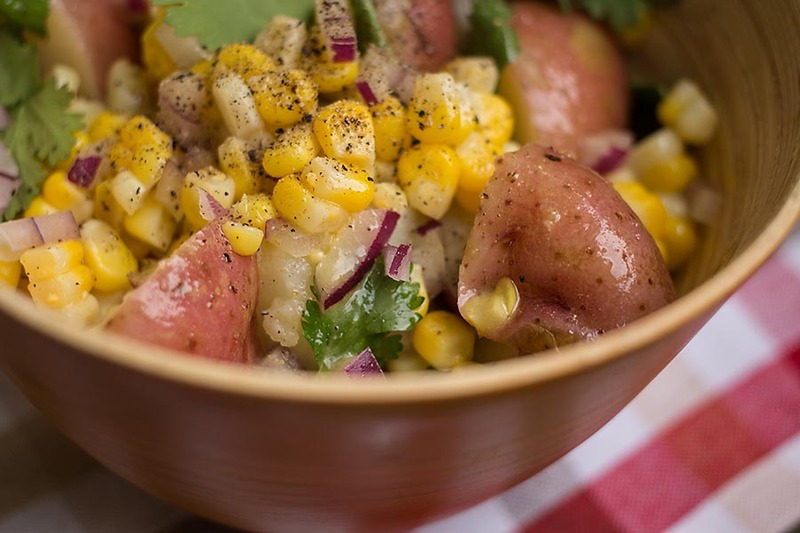 If you want a heftier potato and corn salad, you could always include sausage. Polish sausage, Italian sausage, or chorizo would be delicious! I added a little ground black pepper to the salad as well. Cayenne flakes would be good, too. The other day while I was on hold with American Airlines, I spent the hours perusing recipes at Epicurious.com. I love the site, and its recipe search engine is very smart. You can search for a specific ingredient, for only dessert recipes, holiday dishes, and so forth. I was just searching randomly, to pass the time, but then I came across this recipe: Red Cabbage Salad with Green Apple, Lingonberry Preserves, and Toasted Walnuts. 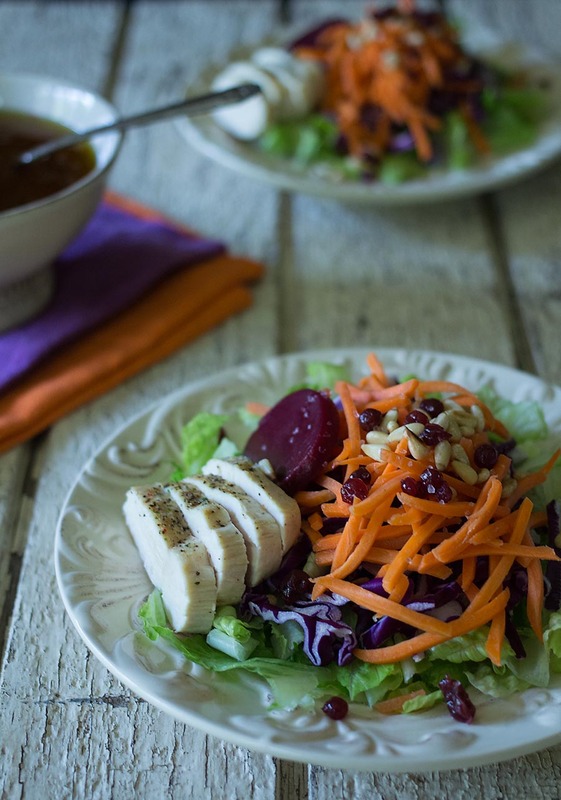 The salad wasn’t too different than ones I’ve made; I’ve even blogged about a couple that are very similar, because I happen to love hearty, crunchy salads. It was the dressing, made with lingonberry preserves, that really caught my attention. So that idea stayed in my head, and when I was at Whole Foods last week I found them! Swedish Lingonberries! I couldn’t wait to play with them and make a vinaigrette. 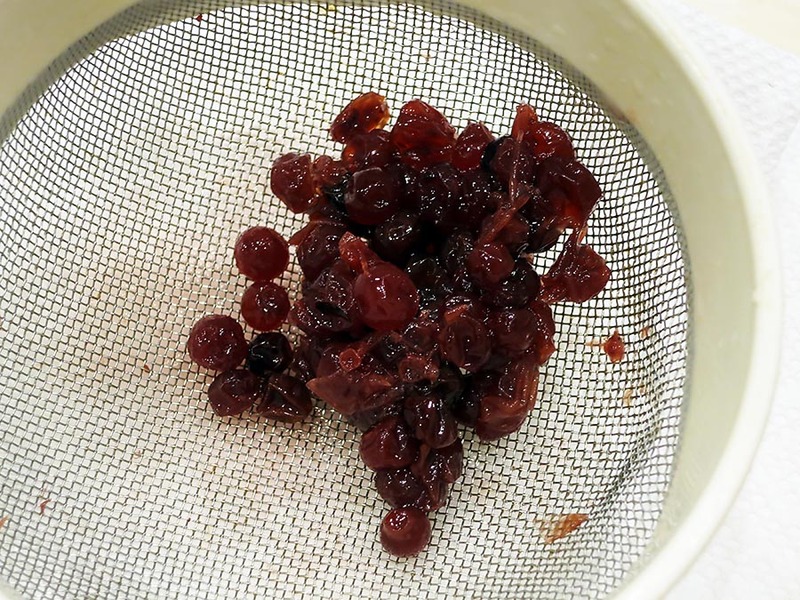 From the list of ingredients, lingonberries, sugar, and pectin, I expected the lingonberries to be very jam-like. In fact, they weren’t very sweet at all, and didn’t have a jam-like texture to them either. So I got creative, and here’s what I did. To begin, I added all of the above ingredients to a blender jar, because that’s second nature to me. Then it dawned on me. With beautiful, whole lingonberries in the dressing, it would be much prettier with the ingredients left as is, instead of blending them all together. 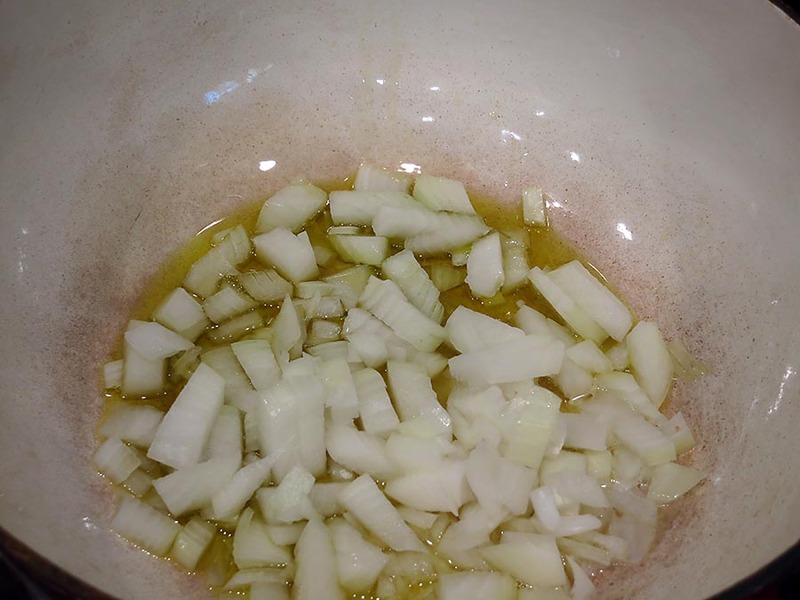 So I simply shook the ingredients in the blender jar, and poured the vinaigrette into a serving bowl. 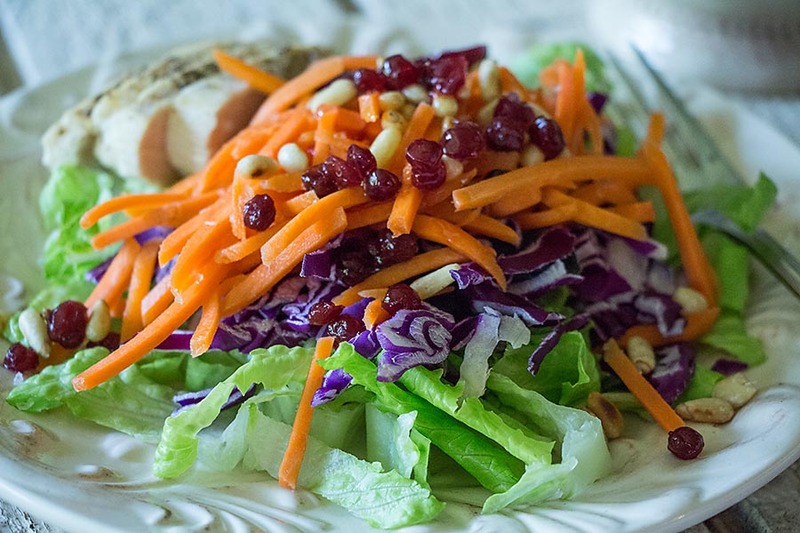 My salad was simple – Romaine lettuce, purple cabbage, carrots, grilled chicken, beets, and a few pine nuts. I also decided to decorate the salad with a few extra lingonberries, so I rinsed some of the “jam” gently with warm water to separate the individual lingonberries. Just now as I’m writing this post, I looked back at the recipe that inspired me, and I wish I’d included apple in my salad. With the lingonberries not being as sweet as I expected, a fruit would have been a delicious addition. But in any case, this vinaigrette is wonderful. Only slightly sweet, and slightly tart at the same time. note: If you don’t love beets, omit the beet juice. I added it, again, because I wanted to offset the sweetness from the berries, but it wasn’t necessary. Because I grew lemongrass in my garden this year, I’ve been focusing on using it as much as possible in Thai as well as non-Thai dishes. This lemongrass seems mild to me, but it has a lemony flavor, and I’m determined to use it all up. Last night I dreamed about using lemongrass to make a pesto. (I can’t be the only person who gets foodie inspirations while sleeeping!) Of course, I’m using the term pesto in the loosest way. It contains nuts and herbs, but I changed things up a bit. To keep with the Asian theme by including lemongrass, I also used ginger and garlic. Then, I used basil, cilantro and chile peppers*. The nuts? Pine nuts. They’re used in Asian cuisines, so I’m still keeping with the theme! If I did invent this stuff, I can die happy. And I can honestly say I’ve never seen anything similar on blogs or in cookbooks. But it is so good I plan on making a lot of it and sharing. If I had any reservations about this pesto, it was that the ginger, being raw, might taste too strong. But fortunately, it didn’t. The resulting pesto-looking mixture was fabulous on this butternut squash soup – almost like how a gremolata perks things up a bit. But the pesto would be great smeared on chicken breasts, pork, even fish. The possibilities for using it are endless. Here’s what I did. Place the toasted pine nuts in a blender jar. Add the garlic, ginger, lemongrass and chile peppers. Add olive oil until it covers the ingredients. Add the cilantro and basil and blend again. Store in the refrigerator, or freeze until later use. 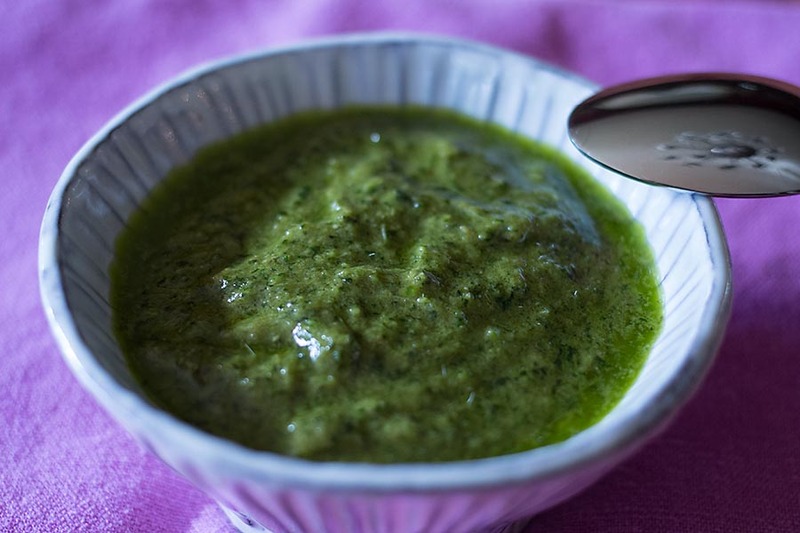 Since originally making this pesto and writing the post, I have had salmon topped with this pesto. And it was fabulous!!! * The chile peppers I used were Nardello peppers. They’re not very hot, but add good flavor. I thought I’d made just about every kind of butter, the fruit kind, until I came across a peach butter on Susan’s blog, called The View from Great Island. I was utterly stupefied! Why had I never thought to make peach butter? I can only think that once it’s fall, I begin using apples, pears, and pumpkins in butters, and different combinations of them all, because fall is my favorite food season. But why not a peach butter in the summer months when peaches are perfectly ripe and delicious? So thank you, Susan! . You’ve all read about my apple tree and how I have to fight the raccoons to get some apples. But this year I started early. 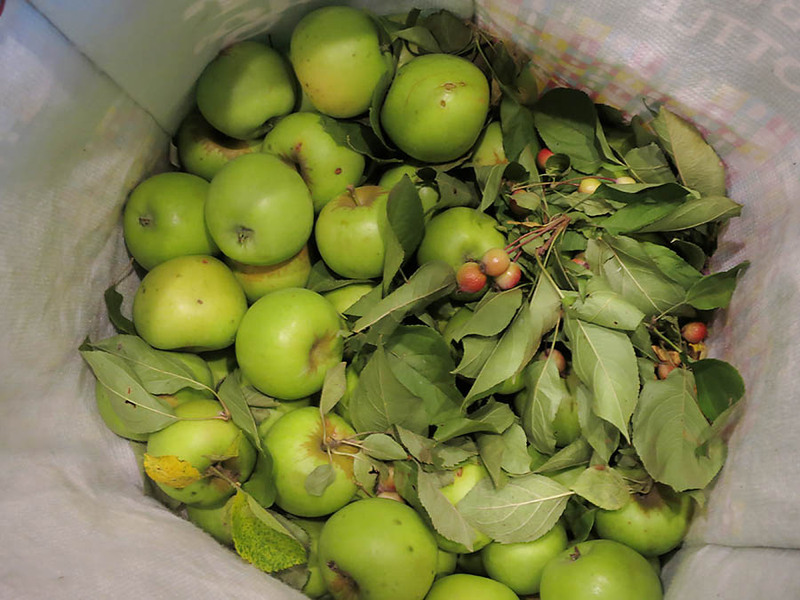 I picked a large bag full, and I won’t stop making things with apples until they’re all gone! Or, until the raccoons get them all. 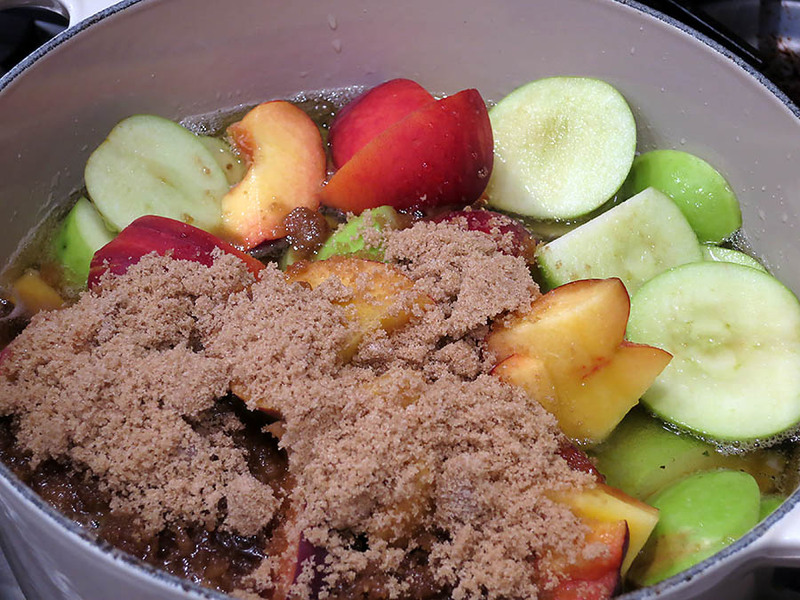 So, inspired by the peach butter, but also with an overabundance of green apples, I decided to combine the two. I was pretty sure the butter would be more on the peachy side, because these apples don’t have much flavor. To enhance flavors, I used two unique ingredients to butter making. 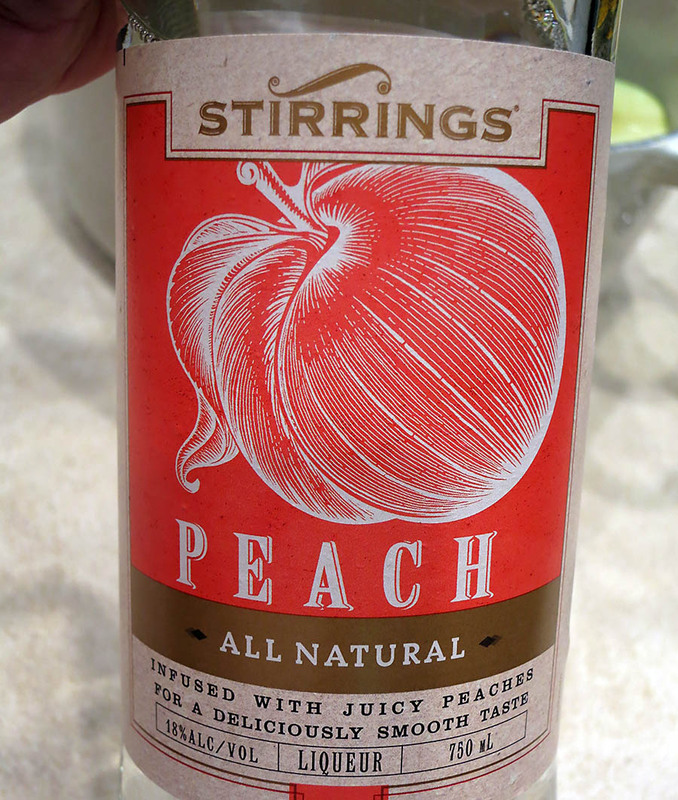 One was peach liqueur, made by Stirrings. (Fabulous stuff, by the way.) 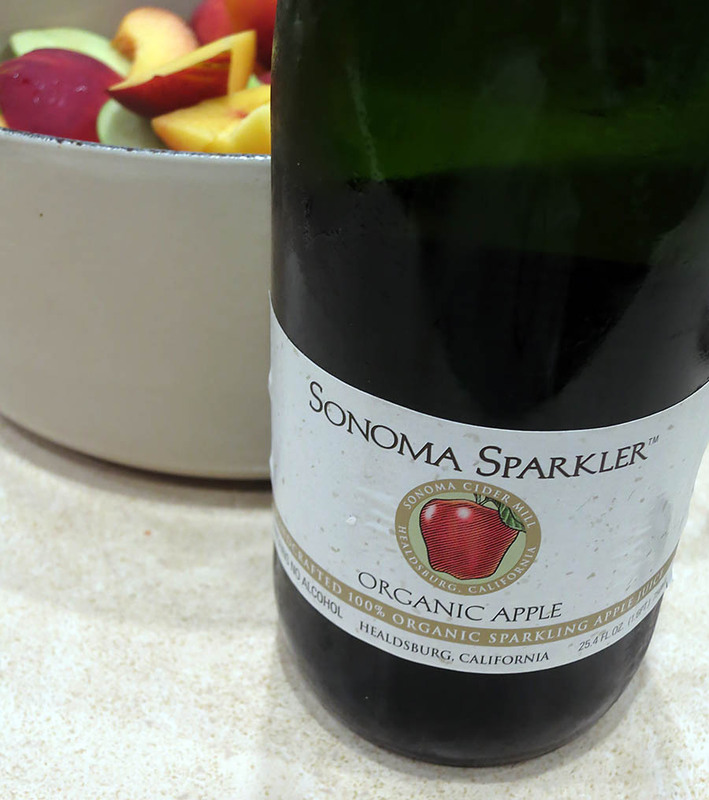 And the other was some sparkling apple juice that was given to me years ago in a gift basket. The reason I’ve had it so long? It’s non-alcoholic. Nuff said. To make a fruit butter, no recipe is needed. 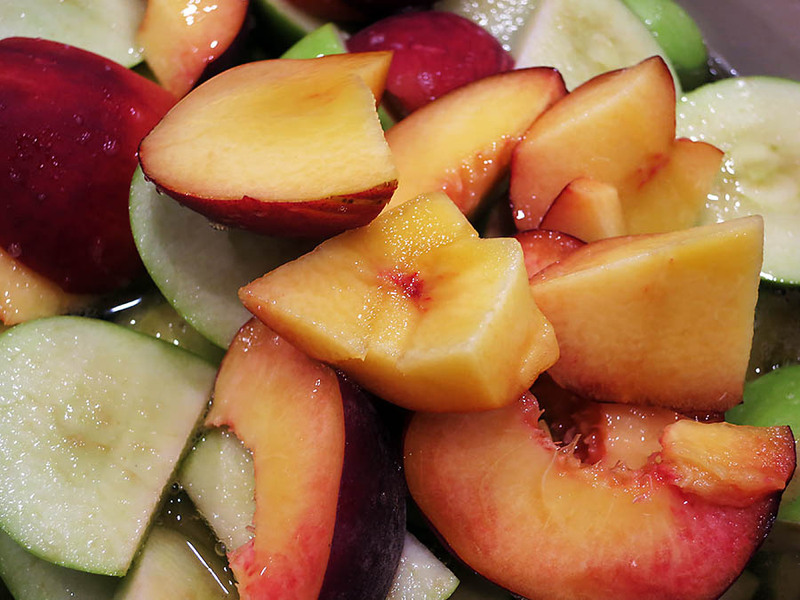 Just start with a lot of fruit of your choice, in this case, apples and peaches, coarsely chopped, and place in a stock pot. Make sure this pot has a well-fitting lid. I added about half of the 750 ml bottle of apple juice to the fruits. And then I added about 1/4 cup of the peach liqueur. To add a little brightness to the flavors, I squeezed a small lemon into the fruit mixture. Give things a stir, and turn on the heat under the pot to medium. You don’t want everything to boil over. Also add some brown sugar. I don’t like my butters to be as sweet as jam, but this is completely your choice. I like using brown sugar over liquid sugars, like maple syrup, to minimize the liquid. You could also add a cinnamon stick or a little cinnamon at this point, but I wanted to taste the final product first and decide what to add, if anything, at that point. Begin by bringing the liquid in the pot to a soft boil, then cover the pot with the lid, and turn down the heat to its lowest setting. This step is to cook the fruit completely. 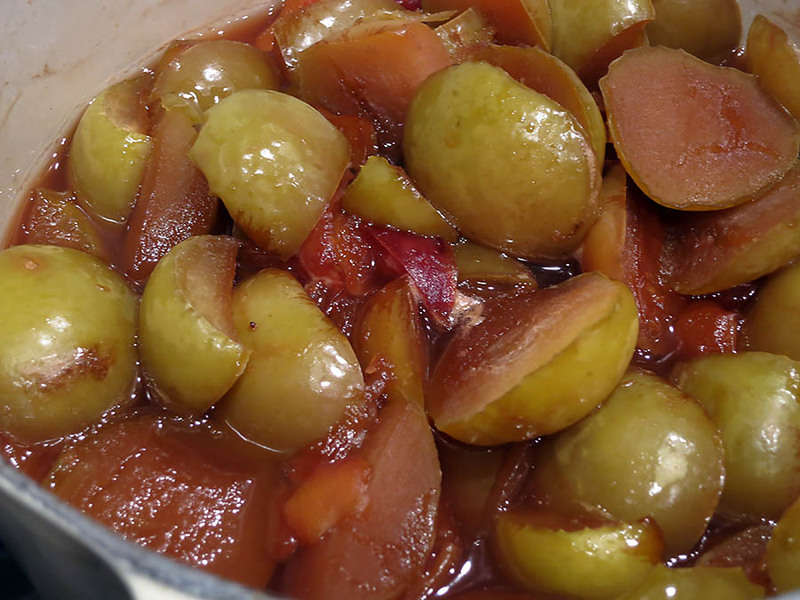 After about 45 minutes, the fruit should be cooked. 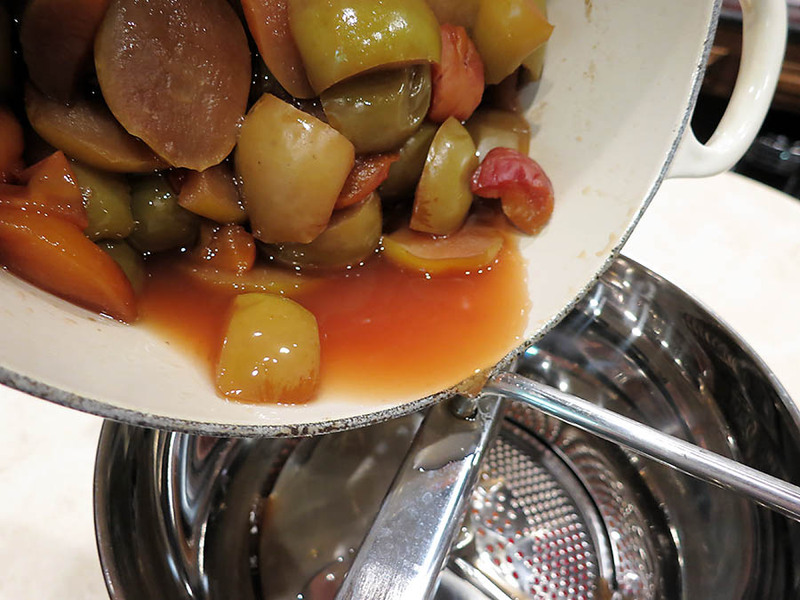 There will probably be a lot of liquid in the pot remaining, so leaving the lid off of the pot, begin reducing the liquid until little remains. Then let the fruit mixture cool completely. 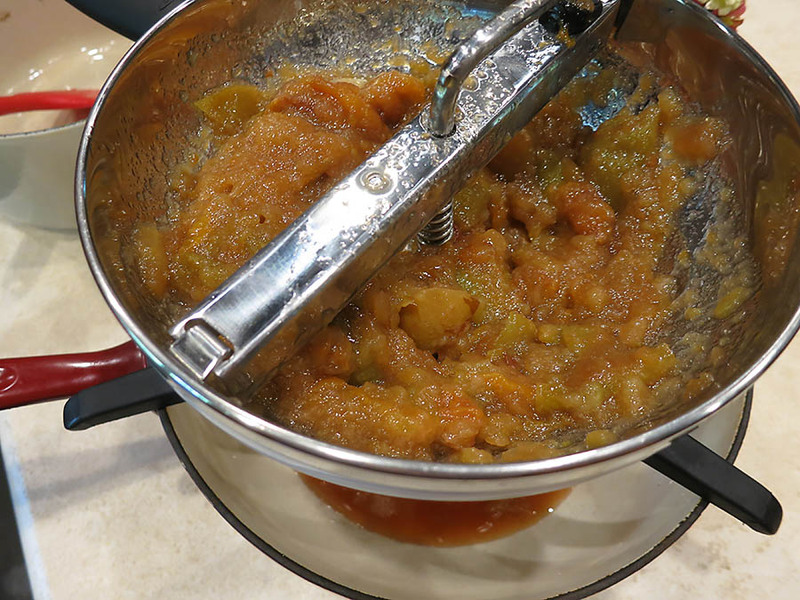 Place a food mill over another pot large enough to hold the apple peach butter. Pour the fruit and all of the liquid into the food mill. After you’re done, you’ll have something that looks like the first picture. Go ahead and stir the butter and the juices together. Evaluate if you need to reduce the mixture. Mine was more like apple sauce, so I spent about 2 hours reducing the mixture over very low heat, stirring occasionally. When it was the consistency of a butter, which is more like a spread, I let the mixture cool. Have clean jars available. I used about 5 pounds of fruit, and ended up with exactly 32 ounces of apple peach butter. Place the butter into the jars and seal. I froze mine, because they thaw perfectly. That way I can make a few different small-batch butters. The way I love to eat a fruit butter is on hot toast, with butter, of course, melting away. Or sometimes paired with peanut or almond butter. I enjoy the fruit flavors, and the minimal sugar. It’s also good in yogurt! verdict: Love it! I think the butter would not have had such good flavor if it weren’t for the good peaches, the peach liqueur, and the apple juice. Fortunately the peaches that I used were perfectly ripe. The color isn’t as pretty as it could be, probably because the green and orange didn’t mix really well. But it’s still good! I have never thought of leeks as an accessory ingredient because of this recipe. These leeks, topped with a warm spicy vinaigrette, could be a first course, a side dish, or a salad. But however you eat these leeks, you will always have respect for this fabulous Allium, if you didn’t already. They’re not just meant to be a filler for potato soup. This recipe is in the Creole and Acadian recipe booklet from the Foods of the World series of Time Life. I actually remember the first time I made these leeks, as part of a full Creole meal. Creole/Cajun/Acadian is an American regional favorite of mine, because of the spiciness, mostly. The recipe is quite simple. It’s just a matter of first cleaning the leeks. Trim them and slice in half lengthwise. Then let running water rinse them off. If you need help with the cleaning technique, click here. Place the cleaned leeks in a shallow pan, and cover with water. Bring to a soft boil, put a lid on the pan, and let the leeks cook for not more than 10 minutes. Using two spoons, carefully place the cooked leeks onto paper towels and let drain and cool off slightly. Alternatively, they could be steamed if you have a large enough steamer basket. The way the recipe has you make it is like making a fairly thin aioli. I opted to just place all of the ingredients into a bowl and whisk them together. And by the way, I didn’t have tarragon vinegar, so I used a combination of apple cider vinegar and fresh tarragon. The recipe suggests that you serve the leeks cold. I notated on the recipe page that they’re good cold or hot, but I think the flavors really pop when at least the vinaigrette is warm. Alternatively, if your leeks are still warm, the room temperature vinaigrette will warm up on the leeks. The heat really enhances the spiciness. Place the drained leeks on a serving plate. Then gently pour on the vinaigrette. As you can tell, I also sprinkled the leeks with tarragon leaves. The sweetness of the leeks really pairs beautifully with the spicy, warm vinaigrette. You just have to try them! Last month when we were in London, we stayed at a lovely hotel called The Orange. There are only four rooms, and they are above the public house and restaurant of the same name, located on Pimlico road. It’s a very old building, but being one of the many Thomas Cubitt businesses, it has a different look to it from typical, dark pubs in England and the UK. I personally have never met a pub I didn’t like – especially the ones with stuff like swords and giant keys and old paintings on the walls. But The Orange has its own updated beauty to it. Right after our daughter moved to London, she taught me to mind my own business in pubs. She knows me well. I love to talk to strangers, and she taught me that in neighborhood pubs, people typically stop by for a pint or two after work. Unless they’re chatting with co-workers, they want to be left alone. But on this one day at The Orange, I just couldn’t help myself. I had been staring at this lovely pitcher of something that looked similar to Pimm’s, but was too pale to be Pimm’s. I told my husband, “I don’t care what Emma says, I’m talking to these guys.” She hadn’t arrived yet. There were four young men at the table next to us, enjoying their mystery drinks, and I politely asked them what it was. The answer? Summer Cup! And then they poured both my husband and myself a drink to sample. I just love British people!!! And they certainly didn’t seem bothered by my inquiry. Take that, Em ! My husband didn’t like it as much as I did because there was a definite cucumber taste to the drink, but it was really good to me. And refreshing. Since it was 30 degrees Centigrade in London on that day, it’s probably why those young men chose Summer Cup to imbibe. I’d never heard of Summer Cup, even though I’ve learned that it’s a popular drink in England. Not so much as Pimm’s, which we did enjoy while in St. Ives, enjoying a gorgeous summer day. 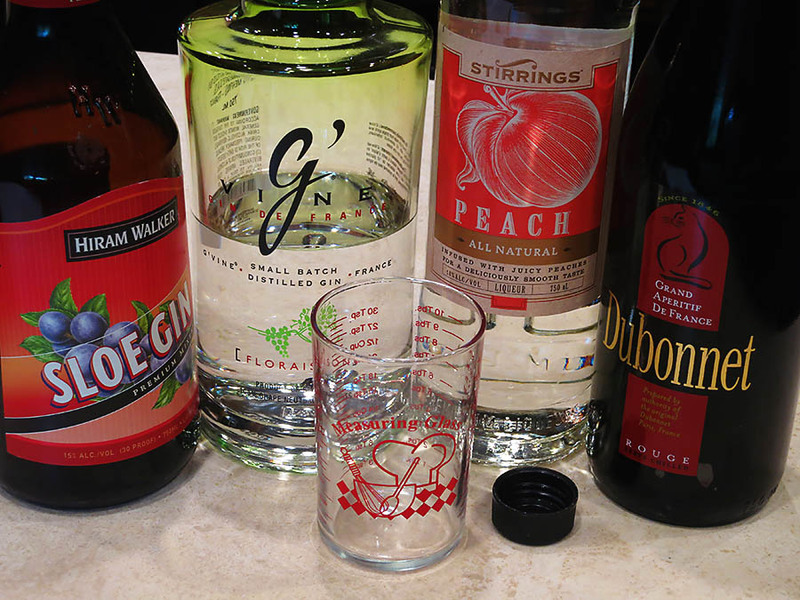 After a little research, I learned that Summer Cup, like Pimm’s, is a gin-based drink. And just like you can buy Pimm’s, you can buy Summer Cup. Except that I can’t where I live. Here is a link to Sipsmith Summer Cup. Beautiful bottle, isn’t it? So I searched for recipes that would mimic, possibly the actual punch. So this is what I found, from House and Garden, the UK version. Was it just like the Summer Cup I had in London? Nah, but it was also really good. I altered the recipe slightly, so the following recipe is what I made. I simply added all of the liquor to a pitcher to make it easy, poured the mixture about 1/4 way in each glass, and topped things off with fresca. Don’t be shy with the fresca – unless you prefer a sweeter cocktail over a punch-like drink, you really need the fizz. I served the “Summer Cup” with a slice of white peach and lime. What I didn’t do was cut up a bunch of fruit and cucumber and place it in the pitcher. That might have actually made the drink taste more similar. Now I have to make it again. darn. * In England, at least, lemonade means Sprite or something similar. So watch out if you think you’re ordering something with real lemon lemonade. I adore salmon, in just about every way. Hot smoked, cold smoked, raw, grilled – you name it. And I’ve always wanted to make my own gravlax. 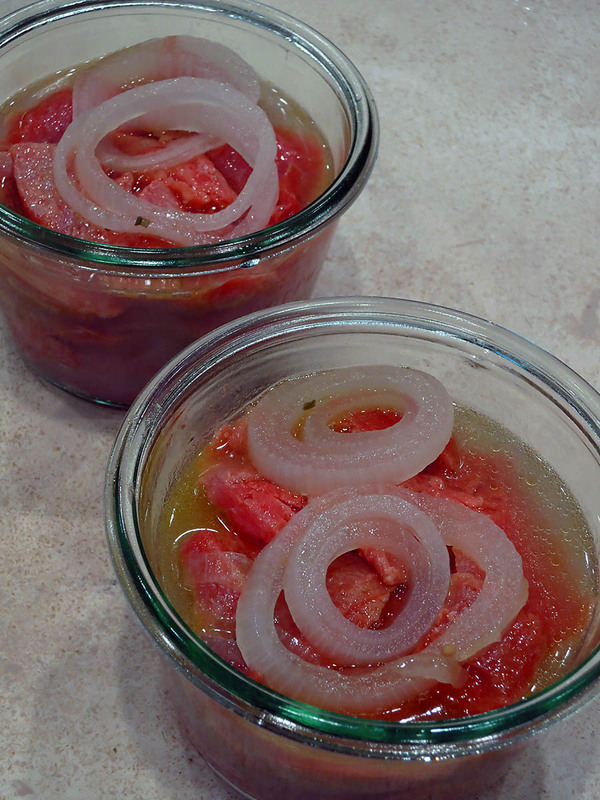 But then I came across this recipe for pickled salmon recently, and I knew I had to make it first. It’s from one of my favorite series of cookbooks that I still refer to – the Foods of the World series by Time Life. This recipe is from American Cooking: The Northwest. Sorry for the blurriness. Now, this recipe can’t replace gravlax, which is cured salmon. This recipe is pickled salmon, so I’m still promising myself to still make gravlax soon. I’m typing up the recipe as it is in the recipe book, and I did pretty much follow the recipe. However, instead of a large side of salmon, I used a smaller, frozen filet (thawed first) that was barely over a pound, and crudely adjusted the other ingredients accordingly. I mean, what’s 2 bay leaves divided by 5? This salmon is super easy to make, and can be enjoyed within one week when it’s stored in the refrigerator, which it must be. I served mine with crackers, quite simply. If you love anything that’s pickled, you’ll love this pickled salmon! 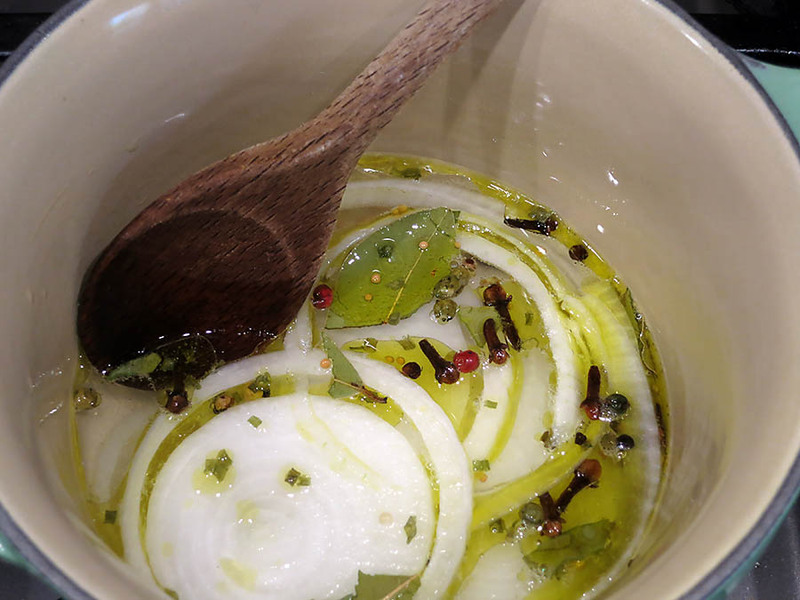 Combine the vinegar, water, olive oil, onions, bay leaves, mustard seeds, cloves, and white and black peppercorns in a 2-3 quart enameled saucepan. Bring to a boil over high heat, reduce the heat to low, and simmer partially covered for 45 minutes. Meanwhile, spread the salmon pieces in one layer on a strip of wax paper. 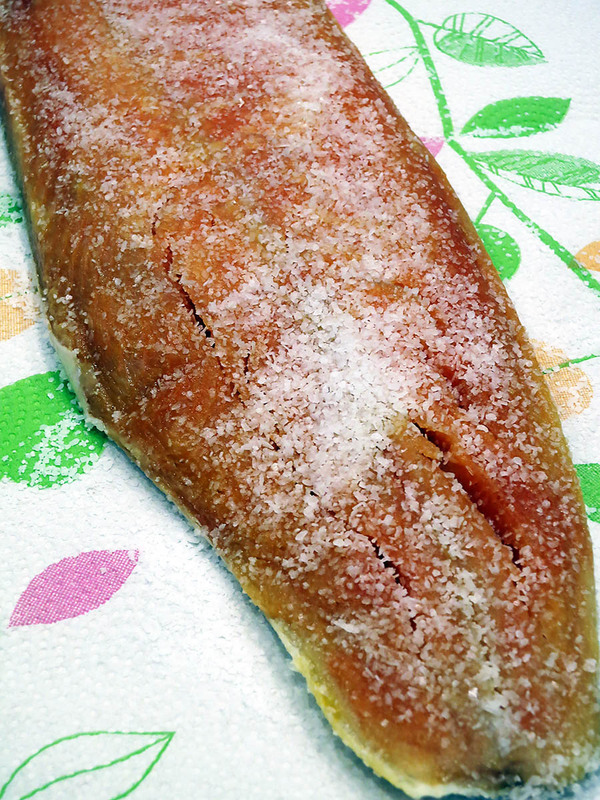 Sprinkle the fish evenly with the salt and let it rest at room temperature for about 30 minutes. Then drop the salmon into a colander and run cold water over it to rinse off the excess salt. Pat the fish dry with paper towels and pack the pieces tightly into a glass jar. Pour the hot vinegar-and-spice mixture over the salmon, a little at a time, allowing the liquid to seep down slowly to the bottom of the jar before adding more. Cool to room temperature, tightly cover with foil or plastic wrap, and refrigerate the salmon for at least 24 hours before serving. Tightly covered, it can be safely kept in the refrigerator for about a week. Before serving, I poured off the liquid. I didn’t want the salmon to be watery. I added a little marscapone to the crackers before topping them with the salmon, and it was really nice. The marscapone toned down the vinegary flavor, but the salmon was good. 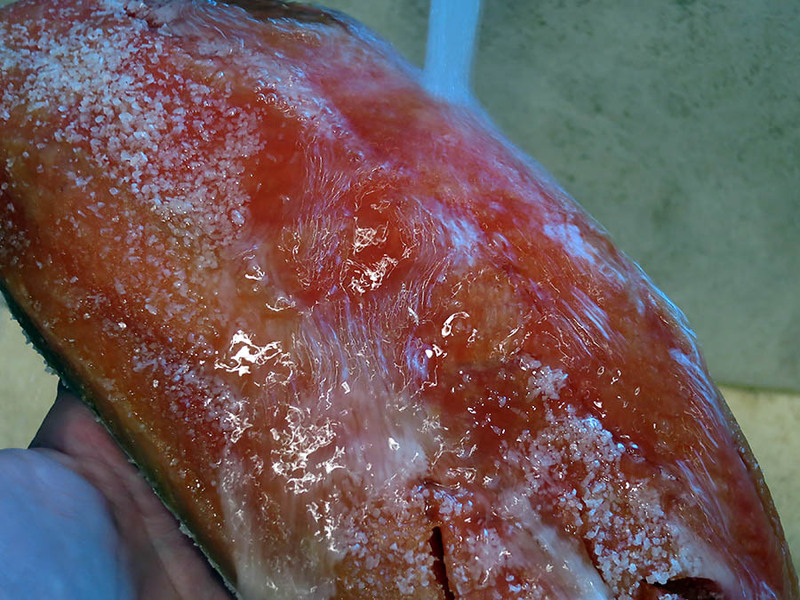 note: I kept the salmon in one piece to do the salting part, rinsed it and dried it, and then sliced it up. Way easier. I also decided to include a few of the pickled onion rings along with the salmon.